Amizade is seeking families from the Pittsburgh area to host high school students and adult mentors from Bolivia and Peru this fall! Amizade is proud to be running the Youth Ambassadors Program with South America for a second year in a row, a program of the U.S. Department of State that involves a two-way exchange for youth to travel, learn about a new culture and language, and develop their leadership and teamwork skills. 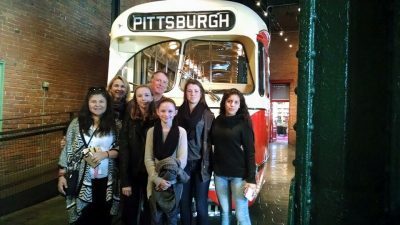 In July of 2016, Amizade will send 12 high school students from West Virginia and Western Pennsylvania to Bolivia and Peru for three weeks, and in October of 2016, Amizade will host students from Peru and Bolivia in Pittsburgh! The exact hosting dates are Saturday, Oct. 22-Saturday Nov. 5. One of the highlights of the Youth Ambassadors Program is the host family stay. Amizade is seeking families from Pittsburgh who are excited about hosting students or adult mentors from Bolivia or Peru for two weeks this fall. While most of the days will be busy with scheduled program activities, the guests will spend evenings and two weekend days with the host families. All students speak English, but if you, or anyone in your family, speaks Spanish this is a great way to practice your language skills. Hosting a Youth Ambassador in your home in Pittsburgh is a great way to bring cross-cultural friendship and learning to your home and is a fun and unique way for you and your family to learn about a new culture and share your family, community, and traditions with a young person from Bolivia or Peru. Check out this awesome opportunity to bring the world to your home, apply to be a Youth Ambassador Host family today! The Youth Ambassadors Program with South America (YAPSA) is a program of the U.S. Department of State, Bureau of Education and Cultural Affairs, administered by Amizade. For more information about this program, click here.